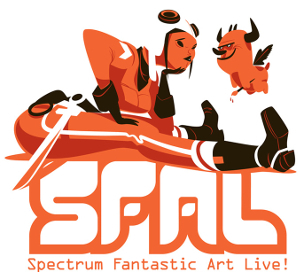 This year I am going to have a table at Spectrum Fantastic Art Live, which takes place in Kansas City on May 9-11. I have never had a table at an art show before, and there's not a lot of information online about the nuts-and-bolts of running a table. So for the past few weeks I have been educating myself, researching blog posts, asking questions of art friends and nervously clicking the "order" button on batches of Kelley McMorris Illustration merchandise, not knowing if any of it is going to sell. So, why not document this journey on my blog? I'll share articles I found helpful, my experiences with getting an art book printed, how I designed a vertical banner and finally I'll tell you how the actual show goes. After the show I'll do a while financial breakdown of how much money I spent and how many items I sold. You can all learn from my mistakes! Have you ever run a table at an art show before? If so, do you have any advice, recommended blog posts to read, or printing companies you like? And if you live near Kansas City, please stop by the show and say hi to me! This should be an interesting story! Be sure to use bold, definitive terms like "shattered", "extrusion", and "gastropod". I'll be keeping an eye out for these posts. I've never had a table at an art show, but it's something I'm working towards. I will have a tiny painting at Jon Schindehette's booth though! Good luck at SFAL!